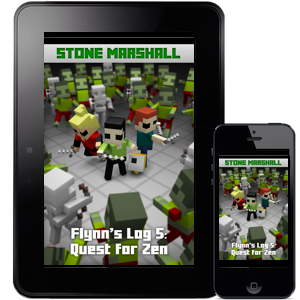 Flynn’s Log 5: Quest for Zen – Available now! Alone in his digital world, Flynn searches for a way to forget what he’s lost. His friends trapped in the “old world,” Flynn is alive in Invivitas! But whose side is he on? While Zana is in the physical world trying to force all humans to enter Invivitas, Flynn is living in the digital world and runs into new trouble. Can his friends save Flynn? Will he survive or will he encounter digital death? About the Flynn’s Log series: In the near future, video games begin to change and evolve. Random bits of data evolve to create a virtual intelligence that takes over the digital world. A digital crisis is born, bringing the real world to a halt. The only person who can save the world is Flynn, but he needs help from his friends, the Hackers.